The spectacular canyons, reefs, and mesas along Highway 6 in Utah range in color from brick to coffee-with-cream. We passed several former coal-mining towns. After Price driving became tedious because much of the highway was only two lanes and there were a lot of trucks to slow us down. 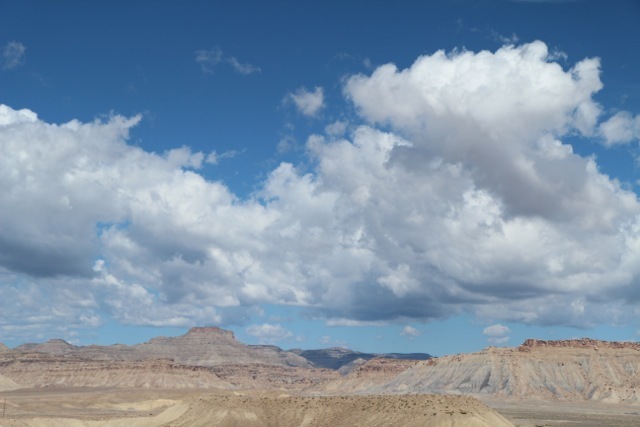 Dan could drive only about 55, but the scenery was amazing. On the left was a mighty reef of rock that extended for many miles. We left Provo at 10 a.m.; weather was clear and pleasant. We had lunch at Subway in Green River. We had an ice cream break around 3:30 in Parachute, Colorado. 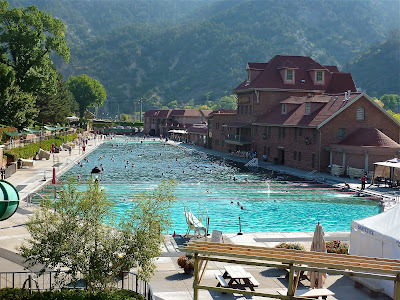 We arrived in Glenwood Springs about 5:00, but parking and loading is awkward there so we weren't able to get down to the pool until 6:00. The sun was down, but the hills were glowing. The air was slightly chilly. 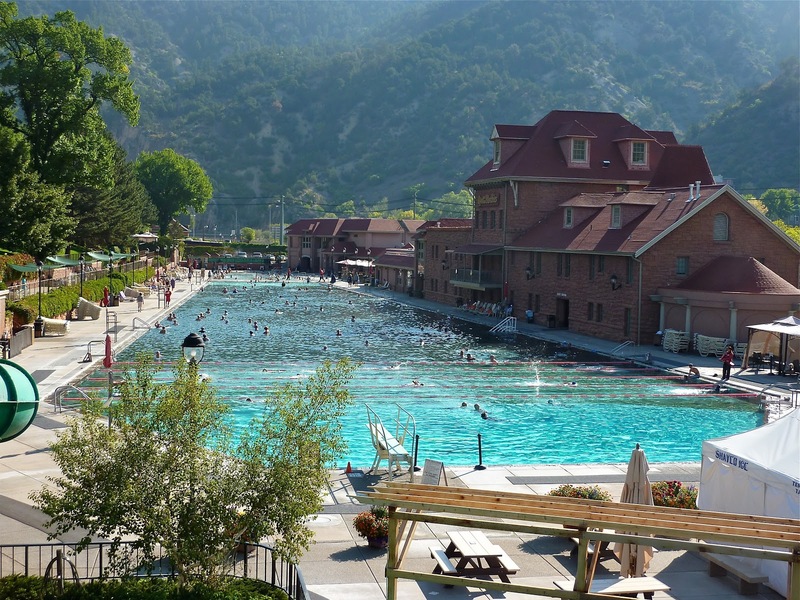 Glenwood Springs has the largest hot springs pool in the U.S. It is so long that it takes about 15 minutes to swim the length. Except for the lap pool and a diving pool, it is only about 4 feet deep, so most people walk. The water is slightly sulfurous and salty; some folks consider it to be therapeutic. There were about 50 people in the pool; mostly walking and talking in small groups; mostly speaking foreign languages. There was still plenty of room to swim on your back for a long time without running into anyone. Everyone there seemed to be euphoric. For dinner we went to the historic Hotel Colorado, next door to the Hot Springs Hotel where we were staying. They were serving on the patio only, but the night was warm enough. We both had pork meatballs with polenta and a side of asparagus. Good. Best meal on the trip so far.